Richard F. Bach. 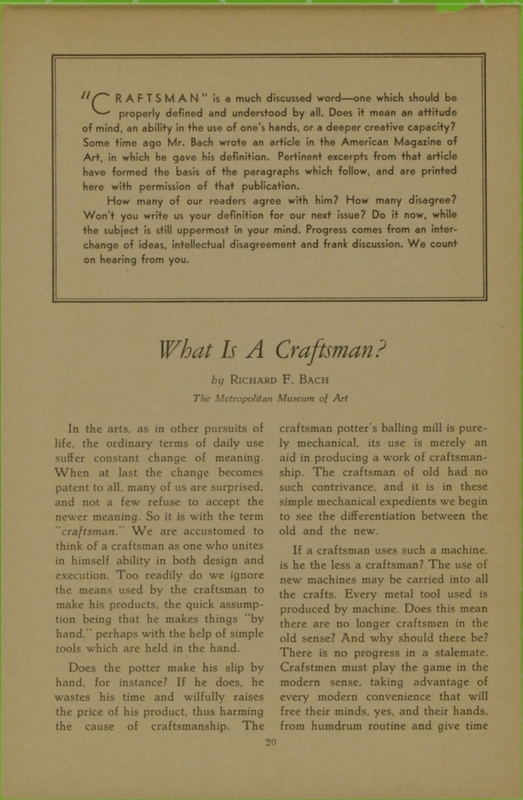 “What is a Craftsman?” Craft Horizons 1, no. 1 (November 1941), 20-21. Reproduced with permission of the American Craft Council. “CRAFTSMAN” is a much discussed word—one which should be properly defined and understood by all. Does it mean an attitude of mind, an ability in the use of one’s hands, or a deeper creative capacity? Some time ago Mr. Bach wrote an article in the American Magazine of Art, in which he gave his definition. Pertinent excerpts from that article have formed the basis of the paragraphs which follow, and are printed here with permission of that publication. How many of our readers agree with him? How many disagree? Won’t you write us your definition for our next issue? Do it now, while the subject is still uppermost in your mind. Progress comes from an inter-change of ideas, intellectual disagreement and frank discussion. We count on hearing from you. In the arts, as in other pursuits of life, the ordinary terms of daily use suffer constant change of meaning. When at last the change becomes patent to all, many of us are surprised, and not a few refuse to accept the newer meaning. So it is with the term “craftsman.” We are accustomed to think of a craftsman as one who unites in himself ability in both design and execution. Too readily do we ignore the means used by the craftsman to make his products, the quick assumption being that he makes things “by hand,” perhaps with the help of simple tools which are held in the hand. Does the potter make his slip by hand, for instance? If he does, he wastes his time and willfully raises the price of his product, thus harming the cause of craftsmanship. The craftsman potter’s balling mill is purely mechanical; its use is merely an aid in producing a work of craftsmanship. The craftsman of old had no such contrivance, and it is in these simple mechanical expedients we begin to see the differentiation between the old and the new. If a craftsman uses such a machine, is he the less a craftsman? The use of new machines may be carried into all the crafts. Every metal tool used is produced by machine. Does this mean there are no longer craftsmen in the old sense? And why should there be? There is no progress in a stalemate. Craftsmen must play the game in the modern sense, taking advantage of every modern convenience that will free their minds, yes, and their hands, from humdrum routine and give time and space for design. The one con-trolling thought remains—the craftsman must unite in himself the ability both to design and to produce; from beginning to end the whole process must be within his power. Now many a craftsman of old gained a popularity which made it impossible for him to turn out the pieces called for by his trade. As this grew he added assistants to his staff, till finally he had a large shop. Thinking out his problem, he saw the advantage of assigning to these helpers the kind of work for which they seemed best fitted. The result was a smooth-running shop, manned by specialists, turning out material more rapidly and in all probability better than before. The master still knew the whole gamut of duties, but his hand touched lathe and mallet less frequently. Nevertheless, he remained a craftsman to the end of his days, and in this way he profited by his success and spread his own genius out to more and more people. No doubt there were not a great many shops of this type, but their example appears in the larger craftsman shops we have now, and the controlling thought still remains: the master of the establishment must unite within himself the ability both to design and to produce. The difference appears in his assistants. Among these we find specialists who have no ambition to become craftsmen; and some who may be but laborers in the plant. And among these we also find artisans, skilled minds and hands, that will in the end replace those of the master and perpetuate the craft. Craftsmanship characterizes the plant as well as the individual. When that plant uses machinery which becomes too complicated for one person to manage, or where there are too many machines for him to control, the plant becomes a factory, and we will find it used for quantity production. But until that point is reached and as long as the master still unites within himself the ability both to design and to produce everything his establishment turns out, we have craftsmanship. The presence of steam, electricity or water motive power is no bar to craftsmanship, . . . nor is the use of machines, as such. A hacksaw is a machine! A catapult in ancient Rome was an “engine” of war. We have come a long way from the old conception, though without question there will always be craftsmen who work with their hands and with the simplest tools because they like to—and can afford to, which may be more important in these crowded times. It would be well to remember that a craftsman is not a holy hermit of art, bound to wear a halo in the hereafter because he is a craftsman; nor is his work bound to be good because it was done by a craftsman. Craftsmanship improves, as do other things, by competition. 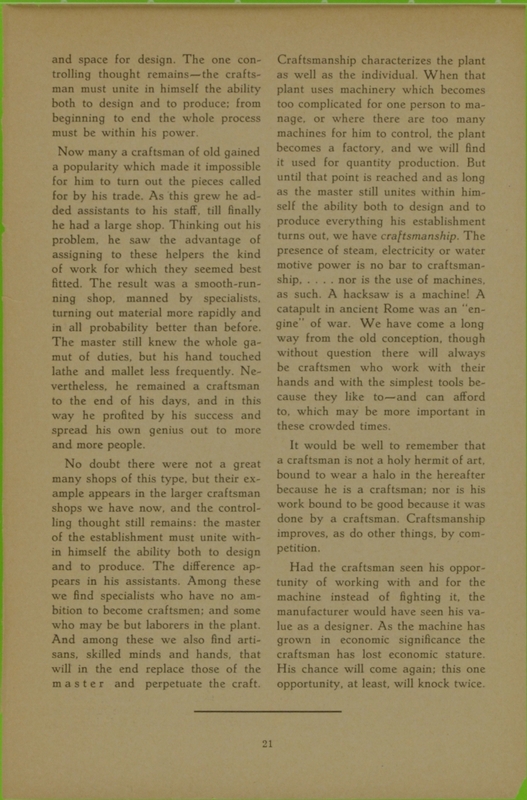 Had the craftsman seen his opportunity of working with and for the machine instead of fighting it, the manufacturer would have seen his value as a designer. As the machine has grown in economic significance the craftsman has lost economic stature. His chance will come again; this one opportunity, at least, will knock twice.